Large windows fill this roomy apartment with natural light, overlooking Wolnica Plaza, the main square of the Kazimierz District. High ceilings and quality furnishings will ensure your stay is comfortable and inspiring. LOCATION ... LOCATION! Walk down stairs and you're in the heart of the old Jewish District, with its historical sites and lively nightlife. Walk south down Mostowa Street 2 blocks to the footbridge crossing the Vistula River to the hip Podgórze District for more cafes and historical points of interest. Head north at a leisurely pace and you're at Wawel Castle in 10 minutes; another 5 minutes to Rynek Głowny, Krakow's main square. Or, hop on the tram instead, just meters from your front door. Enjoy the atmosphere on the river by dining on the boat restaurants or walking along it for the scenic route to Wawel Castle and the center. On a nice day, you might rent a bike from the square across the street and ride along the Vistula River. The kitchen is beautifully designed, fully-equipped with all you need to make a meal, plus a dish washer to make cleanup easy. A 24-hour grocery store is half a block away. Two bright and clean bathrooms, an enclosed balcony and a snug, well-lit reading area add to the ambiance. You can count on the free wi-fi. Stay cosy in winter with efficient heating. Cool off in summer with air conditioning. Plus, there's a washing machine so you don't have to pack too much. A beautifully designed space, natural light and an epic view of the square mean you will be comfortable inside this haven in the center of the city and have easy access to all it offers. The owners live just a couple blocks away and will be happy to help you on your way to explore the city they love. 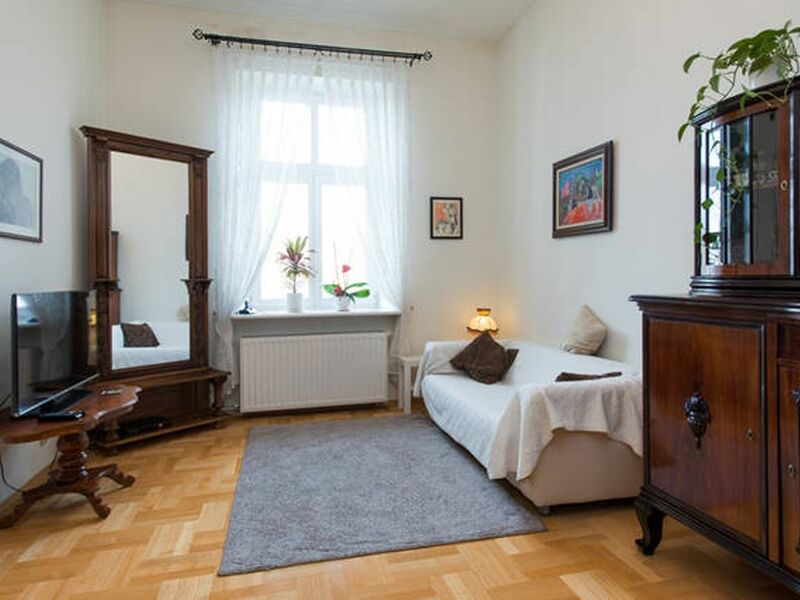 An atmospheric, warmth and charm apartment located in the historic tenements. A comfortable and large fully furnished apartment. Big windows, air conditioning, heating make you feel very well at any time. Near to the Market Square, Wawel Castle, Kazimierz. You can stroll through the beautyfull streets or stop for a moment to feel the atmosphere of the city. I love this city for smiling people, climate, architecture. We spent 5 days in Krakow and really enjoyed our stay here. The value for price is great and it was the perfect size for our family (2 adults + 2 kids under 5). There were 3 beds, all double-sized, one was lofted. There isn't a lot of separation (one set of doors between 1 bed and the 2 others), but the living room can be closed off via doors from the sleeping area. That was handy when the kids went to bed earlier than we did! The kitchen is huge & had everything we could think of & more. I could have easily stayed a week or longer. Laundry, wifi, cable, dishwasher - all worked beautifully and Magdalena had all the supplies we needed for washing clothes, running the dishwasher, and showering. Air conditioning! This was such a relief for the hot summer days. Last but not least: location was perfect. It's easily walkable to so many bars, restaurants, cafes, the river, and even playgrounds. We spent many hours just kicking a soccer ball around the square across the street, followed by ice cream at Good Lood. That it's about 10 mins walk to Wawel Castle, and about 20 to the old town, plus great transit connections, made it the perfect base from which to explore this beautiful city. Thank you for a great stay! I will be recommending a visit to Krakow and this apartment and hope to be back soon!